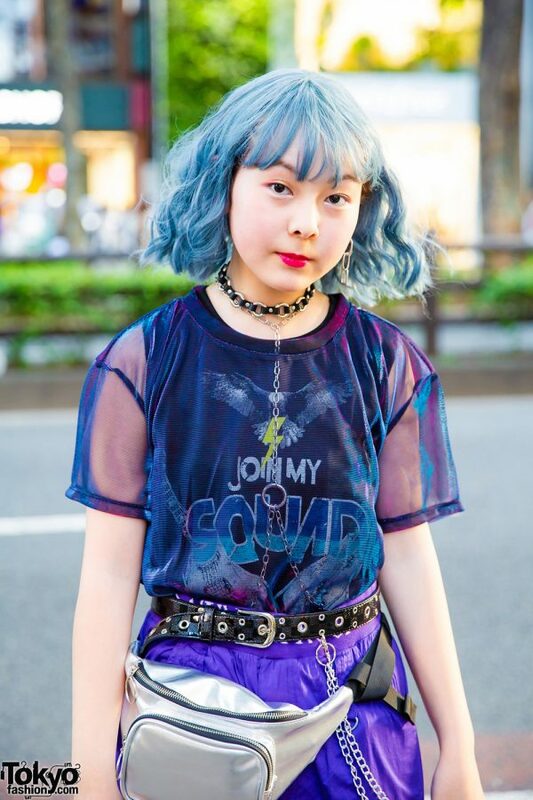 Here’s Yui, who brought a dose of color on the streets of Harajuku with their blue hair and bright purple pants. The 15-year-old student stepped out in layered tops from (Me) and Forever 21 – one is a sheer short-sleeved shirt and the other is a sleeveless graphic tee. Yui tucked them into loose-fitting purple pants, which were cinched at the waist with a black grommet belt and styled with silver chains. 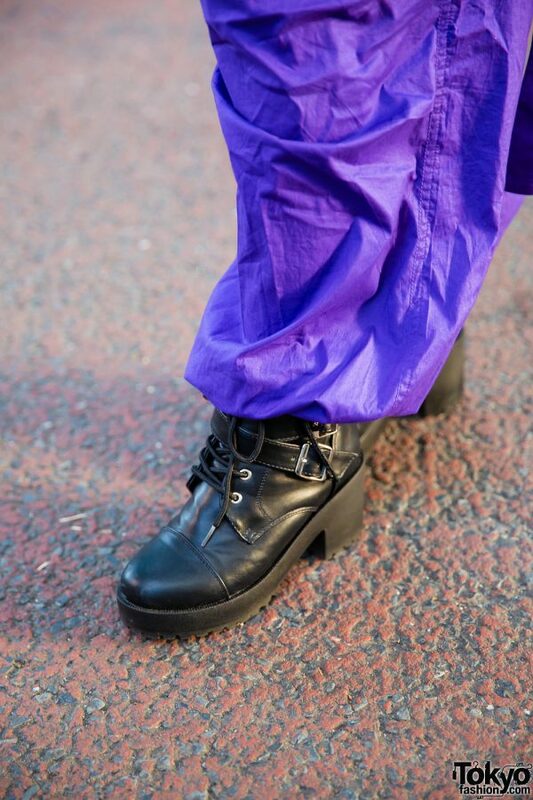 They also wore Takeshita Dori black leather buckled boots with block heels and a lace-up design. Yui styled them with Faith Tokyo accessories such as chunky silver rings, dangling chain earrings, a black leather choker, and a chain necklace. 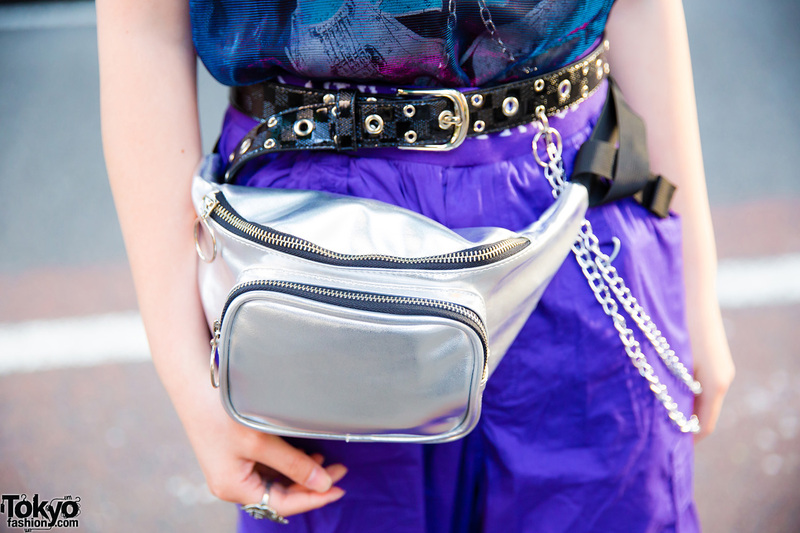 A silver waist bag from WEGO, bright pink lips, and a blue wavy bob with bangs provided the finishing touches to their look. Yui loves shopping at Never Mind the XU and listening to K-pop music. Follow them on Instagram to keep up with their social media updates.